OPINION: Is Pierpoint the man to take the helm at Forest? With the impending ownership changes close to completion at Nottingham Forest, a familiar name has set his sights on the CEO position at the club. Barrie Pierpoint is a man best remembered for his time at Leicester City, having joined them as the marketing director back in 1991. His hands-on approach saw him promoted to chief executive within just two years, a role he held for almost a decade. During his time at LCFC Mr Pierpoint certainly made an impact, most notably taking the club from a £2 million loss-making organisation to a turnover of £24m within an eight-year period. There was of course a public difference of opinion between Martin O’Neill and Mr Pierpoint at one stage, but you would have to speak to Leicester City supporters regarding that matter. Nottingham-born, Barrie Pierpoint has in his own words “a passion for Forest” and is relishing the opportunity to turn around the fortunes of this once great club - the timing of which is perfect for any applicant, given the vast restructuring that is taking place and the areas of the organisation that require some serious overhaul. Forest supporters have been crying out for an independent CEO during the Al-Hasawi family’s reign at the club to the point where tensions were frayed between the fans and club owner Fawaz Al-Hasawi. The Kuwaiti has insisted on controlling every facet of the club given his own successful portfolio in the business world, but when it comes to football, you can’t do it all by yourself. I was interested to learn that Mr Pierpoint also had short, but successful spells at both Portsmouth, and Bradford respectively. At Pompey he was responsible for launching new ticketing schemes that resulted in a 50 per cent increase in sales, having had a similar system at Leicester. Mr Pierpoint was also involved with player contracts and stadium development which is something that the successful applicant at Forest will be required to do. His time at Bradford incorporated the opening of a new £9m grandstand whilst overseeing the revenue opportunities that accompanied it. In all honesty, I know very little about Barrie Pierpoint apart from what I’ve researched; though his CV certainly makes impressive reading material. Like anybody, he seems to have his supporters and his opposition; which is par for the course when you’ve been involved with so many football clubs. Interestingly Barrie Pierpoint has some non-League experience, too, with Grantham Town, which as we know is a world away from the Championship. However, an understanding of the non-League set up is essential for any applicant right now when you look at the talent available. Jamie Vardy is the perfect advert for the non-League game, having progressed to scoring in the European Championship finals for England earlier this year. Every pro club in the land is on the lookout for the next Jamie Vardy, and the riches he’ll provide. Therefore, knowledge of the non-League pyramid system and its monetary potential regarding such players is vital. Looking at Mr Pierpoint’s list of association with various organisations, such as Boston United, Leicester Tigers, Peterborough United, Watford Town and Leicestershire Cricket Club, it seems that he likes a challenge. It projects a kind of ‘get in and sort it out’ approach from the outside looking in, and in his own words he’s “pragmatic, open and direct”. 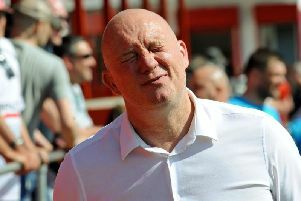 Forest’s last independent CEO was of course Paul Faulkner, who controversially resigned following the sacking of then manager, Stuart Pearce. Since that time Fawaz has tried to run the club almost single-handed and, as I stated earlier, with fierce opposition from the fans. Hopefully, when John Jay Moores finally takes control of the club he will indeed appoint a CEO who will do the club proud. From what I’ve learned about Mr Moores, he is a very level headed and pragmatic businessman himself to the point where he was part of the debt committee in American Baseball. That was a motion that stopped clubs from offsetting monies to cover operating losses, similar to the Financial Fair Play rule in England, which we all know far too much about here in Nottingham. I have no doubts that there will be much competition for the CEO position at Nottingham Forest; and the supporters insist on somebody they can trust. Football divides opinions on every level, from the field of play to oak-panelled boardrooms in every city. Having researched Mr Pierpoint’s business background it obviously throws up those inevitable opinions and divisions. On forestforum.co.uk I read some colourful evaluations about Barrie Pierpont, but on the flip side his CV is littered with awards, promotions and impressive statistics. The very fact that NFFC supporters are talking about an external CEO is positive success and will be a tough gig for whoever takes the hot seat. Mr Pierpoint has clearly stated his intentions to take on the mantle of Nottingham Forest chief executive; so, is he the man for you?